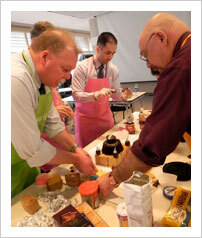 Everyone loves Chocolate, so what could be better than a TeamBuilding activity that includes America's favorite! 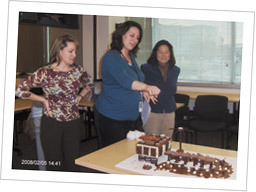 This interactive and delicious activity really capitalizes on your team's creativity and sweet tooth. This is a great event to do before or after a meal and can be enjoyed in lieu of your dessert—or in addition to dessert. Or, you can even take these cake masterpieces back to the office! 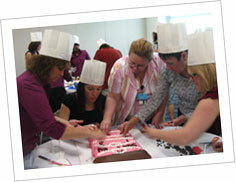 Teams are challenged to design and decorate cakes to reflect their team, their company and more. This event can be done completely with chocolate from the layer cakes to icing to decorations! Your team, goals, objectives, and theme of meeting/event needs to be included in your cake! You can have your cake and eat it, too! A tasting tour through the dynamic and turbulent history of chocolate along with instruction on how to enjoy and appreciate high-end chocolates. Tastings range from 41% through 90% cacao. Our chocolatier guides you through a tasty sensation tour of the world of cacao from the bean to the bar. History, geography, culture and myths are explored. Use all of your senses as you discover and discuss this magical botanical wonderland of flavors, tastes, smells, touch and sights. The Ultimate Chocolate Tasting is a fun and entertaining experience. Team Building Unlimited will provide a variety of high-quality chocolate products to reach all of your senses and make this interactive event entertaining and memorable. Like a wine tasting... only better. A combination of two great tastes! 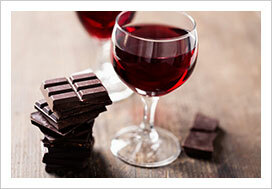 Chocolate and Wine—to die for... Participants will be given an opportunity to taste, sample and rate different Wines (provided by Winery or Caterer) paired with great chocolate with different percentages of cacao. As the participants sample each wine, they will use the five "S," seeing, swirling, smell, sip, and maybe spit, to compare colors, flavors and tastes. Teams will be given a chance to make comments, to keep score and to rate the wines and chocolates that they have tasted, as well as how they pair together. Wine and Chocolate are each complex foods. Their complicated personalities provide no guarantees as to compatibility. There are guidelines as to expectations in taste of both chocolate and wine, but there are always those combinations of specific wine and chocolate that break the rules. This activity adds even more fun to our Chocolate and Wine pairings because it's also a Personality Assessor! People are much more complex in regards to expectations, compatibility, and leadership. It is always fascinating to experience what flavors, textures, and smells each individual perceives when tasting and drinking. What can you tell about a person by hearing that person discuss food and beverage nuances? What do wine and chocolate reveal about character and personality? What thoughts and conclusions will be shared and revealed? Sharing chocolate and wine may not give scientifically accurate result, but it’s great fun, and the process may reveal hidden facets of peoples' personalities. Want more insights into chocolate, chocolate news, recipes, and chocolate health? Check out Janet Rudolph's Chocolate Blog: Dying for Chocolate. We come to YOUR meeting or conference. Anywhere in the U.S.